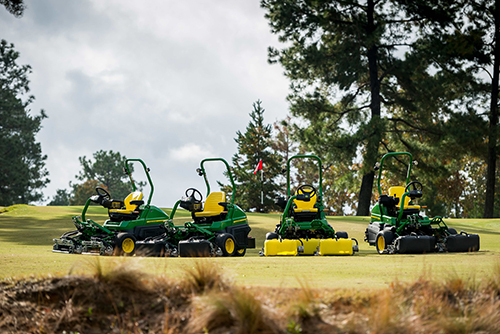 John Deere is rolling out new products — four reel mowers, the GPS PrecisionSprayer and two hybrid fairway mowers — ahead of the 2019 Golf Industry Show. John Deere released four new reel mowers: the 2700 and 2750 PrecisionCut Triplex mowers and the 2700 and 2750 E-Cut Hybrid Triplex mowers. The new mowers provide a lightweight, open-platform machine that includes the TechControl system. Using the passcode protected TechControl system, managers and technicians can input commands, controlling nearly everything regarding the operator’s performance, including frequency of clip, turn speed, clean up pass speed and how fast the cutting units raise and lower. 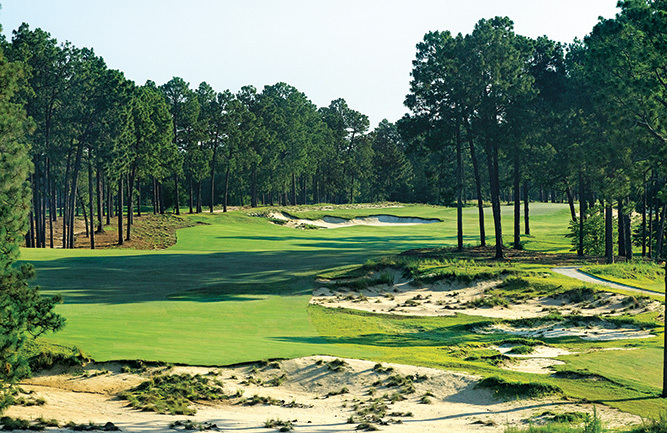 Clean Up Pass Mode is a preset operating mode that allows the operator to automatically reduce mowing speed on perimeter passes to increase accuracy for less scalping or missed grass. Adjustable turn speed helps the superintendent control how fast the operator is able to turn, minimizing chances of turf damage. Additionally, the superintendent or technician can select Eco Mode, which electronically controls the engine speed to conserve fuel. With Eco Mode, the engine RPM automatically adjusts based on the load, saving up to 30 percent on fuel and reducing operating sound levels, the company said. The 2700 and 2750 Triplex mowers feature a lightweight, open-platform frame design with a low center of gravity for enhanced stability and traction performance. The decreased weight reduces tire tracking and compaction, and the open platform makes it easier to access the center grass catcher. The grass catchers can be easily removed and installed with one hand, and have a translucent yellow option for better visibility of clipping levels. Another notable change on the 2700 and 2750 models are improvement to the steering column, which features two points of adjustment — the column and steering wheel — and requires no tools. The 2700 and 2750 Triplex mowers offer a 62-inch mowing width and mow speeds of up to 6 mph. The three-axis lift system provides up to 18 degrees of steering and 42 degrees of contour following for an even cut. The new Triplex mowers will be available for purchase in 2020. John Deere’s GPS PrecisionSprayer, available exclusively on the John Deere ProGator line, is now available for purchase. One of the most notable features on the GPS PrecisionSprayer is AutoTrac, which helps with spraying predetermined areas in less time with greater pass-to-pass accuracy. Another benefit is individual nozzle control, minimizing application errors and reducing operator fatigue. Using the GPS PrecisionSprayer, individual nozzles are able to be paired with the AutoTrac Guidance, limiting wasted product by pass to pass overlapping and off-target applications. With the GPS PrecisionSprayer technology, users can create coverage maps, which can be shared with multiple units, eliminating overlap and increasing productivity. The GPS PrecisionSprayer uses advanced satellite technology to ensure the reliability of boundary maps with Real Time Kinematic (RTK) satellite navigation. 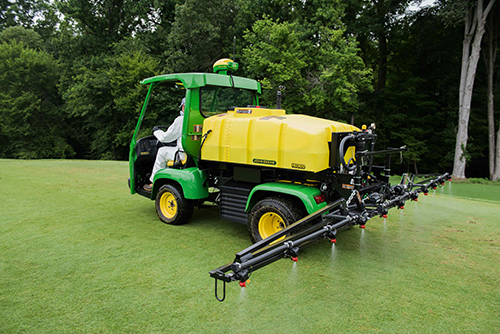 Additionally, the GPS PrecisionSprayer can electronically capture all spray data and analyze the results, streamlining documentation and providing analytics. Finally, John Deere Golf is expanding its 6000A Series with the addition of the 6080A and 6500A E-Cut Hybrid fairway mowers. The 6080A and 6500A E-Cut models feature high-performance electric reel drive and can be operated at lower engine speeds. 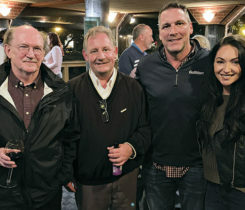 By removing all hydraulics from the reel circuit, the risk of hydraulic leaks has been reduced by more than 90 percent, the company said. In addition, the hybrid system is powered exclusively by an alternator, which offers consistent performance without additional batteries to maintain. 6080A E-Cut Hybrid fairway mower – 18-inch QA5 cutting units provide an 80-inch width of cut. 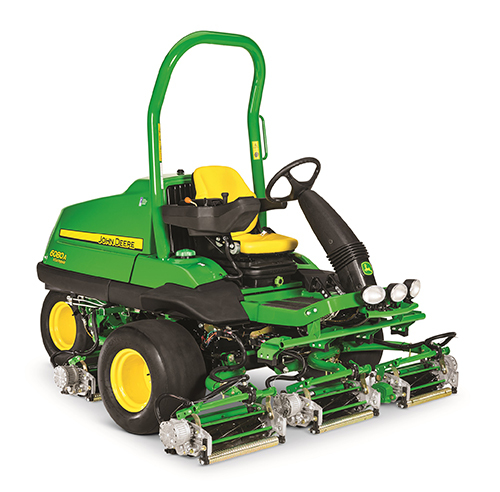 6500A E-Cut Hybrid fairway mower – 22-inch QA5 cutting units provide a 100-inch width of cut. Equipped with a powerful 24.7-hp diesel engine, the 6080A and 6500A E-Cut Hybrid models feature three-wheel smooth tire configurations. The new models include standard LoadMatch and the eHydro transmission, which removes linkages between the pedals and the hydrostatic pump. Both models feature a mowing speed of 8 mph. Also included with the new models is the TechControl Display. The password-protected TechControl display enables turf managers or technicians to input commands, such as mow speed, turf speed, transport speed and service timers, while also capturing on-board service diagnostics. The 6080A and 6500A models also include rear-attaching yokes on the cutting units and standard hydraulic down pressure. Additionally, the hybrid reel drive system allows for more power available for the standard GRIP all-wheel drive traction system. Other notable features on the 6080A and 6500A models include internal hydraulic wet disk brakes and a comfortable operator station with Command Arm-mounted controls that adjust with the seat. The 6080A and 6500A models will be available for purchase in 2020. The newest models will be on display at the Golf Industry Show in San Diego, Calif., from Feb. 6-7. 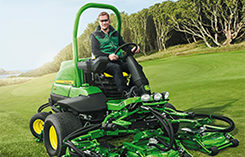 Editor’s Note: Stay tuned for video of the newest John Deere products in action from this year’s Golf Industry Show.